Taylor Hendricks (left) was in court Tuesday on charges stemming from an alleged horse punching incident outside the Eagles/Falcons game. 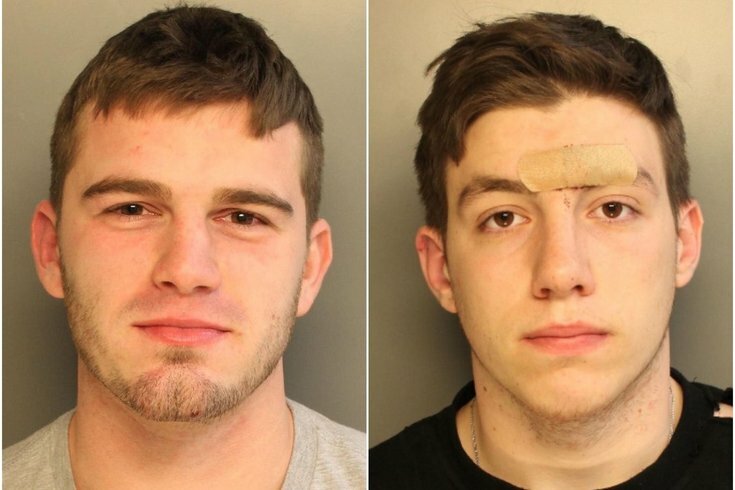 In an apparent copycat crime, Andrew Tornetta (right) was arrested a week later for assaulting a police horse before the Eagles/Vikings game. It's been 17 days since Taylor Hendricks allegedly punched a police horse outside Lincoln Financial Field after getting thrown out of the Eagles/Falcons game for not having a ticket. We use the word allegedly in this circumstance because it's required by the laws of journalism in criminal cases that have still not reached their conclusion. We also use the word allegedly because in a video of that January 13 incident, it's unclear whether the stumbling 22-year-old man wearing but one shoe actually connected with his punch. Philadelphia police say that it happened, which is why the Lehigh County man stands charged with aggravated assault, taunting police animals, simple assault and defiant trespassing. Out on bail since January 14, Hendricks returned to Philadelphia on Tuesday for a scheduled preliminary hearing in the case at the Criminal Justice Center. That hearing would be delayed since his attorney, Trevan Borum, had another client's trial scheduled t the same time. "Nope," Hendricks said, when asked if he had any comment on the case while walking out of the courtroom just before 9 a.m. Contacted by phone from another courtroom, Hendricks' attorney said his client regrets what happened. "He's extremely remorseful and has a very real alcohol problem," Borum said. "He has sought help for that and is actively trying to beat his addiction." Excessive alcohol consumption led to the incident, he added. "He is a bright young man with a promising future," Borum added. "We're hoping he can beat his addiction." Hendricks' hearing was rescheduled for March 1 before Municipal Court Judge Gerard A. Kosinski. After his apparent copycat crime, Andrew Tornetta, a Temple University sophomore, was scheduled for a status hearing in the same courthouse on Tuesday.